TIM MCCANNA writes books, songs, and apps for children. His debut picture book, TEENY TINY TRUCKS, released in October 2013 in hardcover and as an interactive story app. In the coming year, he has two books coming out with Simon & Schuster (BITTY BOTT and WATER SONG) as well as JACK BE NINJA from Scholastic. Tim also produces jingles and book trailers, and is the musical talent behind several iPad apps for kids, including "A Troop is a Group of Monkeys" and "A Shiver of Sharks." Tim's sci-fi musical comedy, "The Cosmic Calamities of Henry Noodle" received critical acclaim at the New York International Fringe Festival, and for years he played accordion and sang for his kid-friendly folk band, The Hobo Nickels. When he's not writing songs and stories of his own, Tim serves as a Assistant Regional Advisor for the San Francisco/South chapter of SCBWI, the Society for Children's Book Writers and Illustrators. Follow Tim's blog, watch his videos, and hear samples of his music at timmccanna.com. ALLISON BLACK is an illustrator and designer specializing in cute and colorful creations. Originally from Upstate New York, Allison received her BFA at Syracuse University, and has since lived in LA, Minneapolis and now Columbus, Ohio. Over the years, she has developed products ranging from baby bedding and toddler clothes to Christmas ornaments and Easter baskets. But no matter what she's creating, she always bring a little Allison flair to the product through her illustration style, thoughtful design, and fanciful critters. 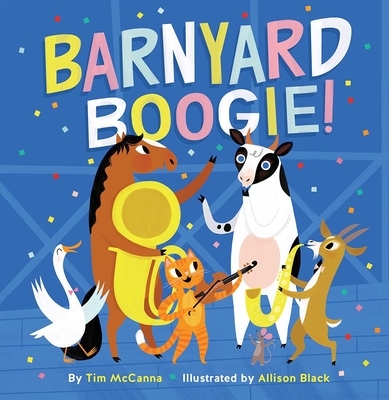 "McCanna's simple and alliterative onomatopoeic text flows across the page in a variety of bright colors, and its brevity and unfaltering scansion suit it well to a toddler audience... A good addition to storytimes on barnyard animals, music, or finding one's talent."